Nice design provided the Owner with excellent living space, and the Owner gave us a lot of support which allows us to give our creativity freely in design. We are very grateful to the Owner for his support, and the Owner said we completed his dream hoped to share such a nice design with the world, and hoped our works can be approved by the design review from Italia while making everybody see we complete the dream of human body. 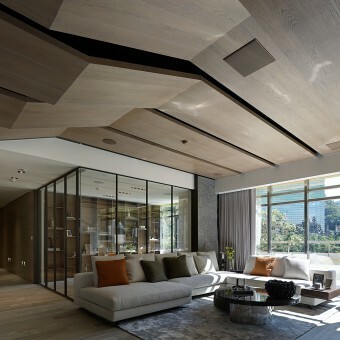 The scenery of the mountain forest shall be brought into the indoor space by using the large French window designed; the outdoor scenery may decorate the home additionally, with indoor air quite ventilated. The four sides are well lighted as a result of the French window. Moreover, the lights in the room flow freely; thus, the not bright space worried by the Owner is solved along with lights irradiating. 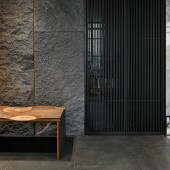 The stone material selected of the television wall is gorgeous, and the peacock stone of the island area in the bar was selected specially with colors which are beautiful like the peacock. Light, fresh air, travel, relaxing, emotion temperature and reading. The Owner hoped there was a comfortable environment to read book or work at home, and found that every space, every corner at home is comfortable for sitting down to read book and suitable for working at home after living in the room, and everywhere at home is comfortable. More time was spent to master the proportion on planning the linear design of ceiling and special curves. Shang Yih Interior Design co., Ltd.
Shang Yih interior design since its inception, emphasizing teamwork combined with professional services as the main targets, the company staff centripetal force strong and consistent belief among my colleagues in coordination with each other. The most efficiency, adhere to the professional, technical and service priorities for the first two demands , has 15 years of complete design. Engineering experience and qualified interior design of the building Technician, artistic design, depending on the space moving lines, housing, the perfect combination of practical convenience and style, clearly show the space unique character, giving the space a new vitality. Stretched Among Peaks Interior Design by Chia-hung Yu, Hao-chien Cheng, Wei-ting Chung is a Nominee in Interior Space and Exhibition Design Category. · Click here to register today inorder to be able to view the profile and other works by Chia-Hung Yu, Hao-Chien Cheng, Wei-Ting Chung when results are announced. Stretched Among Peaks Interior Design by Chia-hung Yu, Hao-chien Cheng, Wei-ting Chung is Winner in Interior Space and Exhibition Design Category, 2015 - 2016. · Read the interview with designer Chia-Hung Yu, Hao-Chien Cheng, Wei-Ting Chung for design Stretched among Peaks here. · Press Members: Login or Register to request an exclusive interview with Chia-Hung Yu, Hao-Chien Cheng, Wei-Ting Chung. · Click here to register inorder to view the profile and other works by Chia-Hung Yu, Hao-Chien Cheng, Wei-Ting Chung. Did you like Chia-hung Yu, Hao-chien Cheng, Wei-ting Chung's Interior Design? Did you like Stretched Among Peaks Interior Design? Help us create a global awareness for good interior design worldwide. Show your support for Chia-hung Yu, Hao-chien Cheng, Wei-ting Chung, the creator of great interior design by gifting them a nomination ticket so that we could promote more of their great interior designs.